The U.S. sugar market has stabilized since the latest agreements with Mexico went into effect, but flat consumption patterns and a global glut of sugar pose problems for the future, sugar analysts highlighted last week at the International Sweetener Symposium, a gathering of the nation’s cane and beet growers. “After a traumatic first 10 years of unrestricted sweetener trade, it appears that the U.S.-Mexico sweetener markets have finally found a reasonable balance,” said Mike Gorrell, president and CEO of the Imperial Sugar Company in Savannah, Georgia. Gorrell was the leading sugar refiner executive insisting that the agreements with Mexico be renegotiated because U.S. refiners were not getting enough raw sugar to refine. Humberto Jasso, executive vice president of the Mexican Sugar Chamber, also said that the agreements are working fairly, but said it is important for the Mexico industry to get as much information as early as possible in the production season about how much sugar the U.S. Department of Agriculture is likely to allow after Mexico’s basic allotment. Mexican growers worry about the possibility that the North American Free Trade Agreement renegotiation might break down, Jasso added. If the United States would withdraw, as President Donald Trump has threatened, and pre-NAFTA tariffs were applied, Mexico would stop importing high-fructose corn syrup because that would basically make the country self-sufficient in sweeteners, Jasso said. Barbara Fecso, director of dairy and sweetener analysis at USDA’s Farm Service Agency, said that last year’s imports were “a little on the high side” and that this year USDA would undertake only “baby steps” when announcing any increases in imports. Under the sugar program in the farm bill, Fecso and others at USDA are supposed to allow enough imports to supply the market without creating an excess that would lower prices so much that U.S. growers would deliver sugar to the government under a nonrecourse loan program. USDA updates U.S. sugar production and use in the monthly World Agricultural Supply and Demand Estimates. Last week, USDA increased beginning stocks for sugar and increased total production for 2018-19 by 312,000 metric tons to 9.09 million metric tons, driven heavily by an expected increase in cane-sugar production. Still, USDA also lowered total use of sugar by 150,000 metric tons. Combined, USDA forecast ending stocks increasing for the 2018-19 crop by 554,000 metric tons, driving up the estimated stocks-to-use ratio for sugar growers from 1.35% forecast last month to a forecast of 18.1% now. USDA also reports the average raw sugar price for June were 25.7 cents a pound, down 2.1 cents from a year earlier. Yet, refined sugar prices have increased 6 cents a pound to 36 cents over the same period. 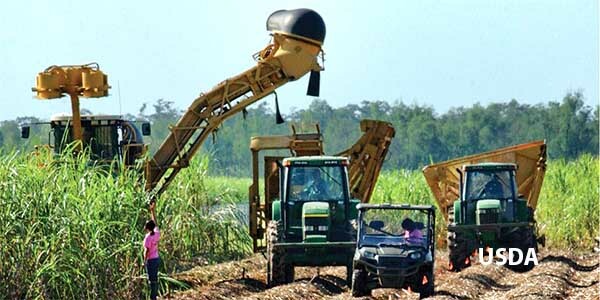 The agreements with Mexico that suspended the U.S. government’s punitive tariffs due to Mexican subsidization of sugar and dumping into the U.S. markets have now provided U.S. cane refiners with enough raw sugar so that they can compete with Midwestern beet sugar producers, Jenkins said. For the cane refiner and beet processor, the agreements are working “pretty well,” Jenkins said. But the analyst also noted that food deliveries are down and that products such as Coke Zero Sugar are doing very well in the marketplace. Smucker’s, he noted, has 22 different jam and jelly products that are either reduced sugar or sugar-free. “They don’t do that to be spiteful. That is what the consumer wants to see,” Jenkins said. Gorrell also pointed out that sweetener consumption has been flat since 2002 and that the only way the sugar industry has grown has been by recapturing market share from high-fructose corn syrup. Gorrell noted that the volume of imported products already containing sugar is also rising. He said that “the last thing” he would say to the growers is that prices are too high, but that the growers need to be aware that imports of sugar-containing products are growing and that the situation is a threat to the industry. Other analysts noted that there is a global glut of sugar and that if world prices go low enough, it will be practical to import that sugar even if the importers have to pay high tariffs on it. Ben Fessler, a market analyst with C. Czarnikow Sugar, said more than 20 million tons of sugar now overhang the international market. While Brazil used to be the producer that most affected the international markets, the current surplus has been largely driven by production expansions in India and Thailand, which both subsidize their sugar industries. Europe also added to the global glut with production levels at 20-year highs, Fessler noted.